Although I’ve never been a huge fan of tequila in the past, I’m finding that I’ve been enjoying it’s influence (or rather its barrel’s influence) on many of the beers I’ve been drinking over the last couple of years. Whether it be a sour ale or what has been unofficially crowned as the style to barrel age, Belgian-styl tripel, the influences have made for truly enjoyable drinking experiences. 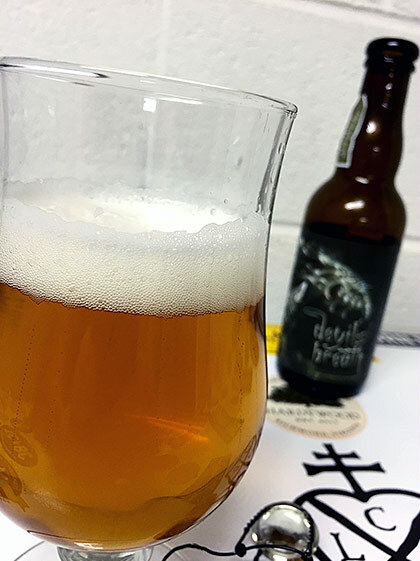 Adroit Theory’s Devil’s Breath is no exception. AT 7.8% ABV, this brew isn’t the most potent example of this genre that I have encountered and there’s a bit of a banana presence creeping in that I’m not overly fond of. Those nits aside, the influence and depth that the barrel aging has added to this beer is more than enough to compensate. Again, I’m not a huge fan of the liquor outside of the way it’s been used in aging beer — its presence here is incredibly smooth and delectable — but there’s just something about it the mixes well with Belgian yeast strains. The beer pours a light, golden amber in color with a short-lived cap of white foam. Distant fruit, yeast, smooth tequila, a touch of wood, soft banana and grain mingle gently. Banana, distant stone fruits, yeast, grain and wonderfully smooth tequila presence persist from start to finish. 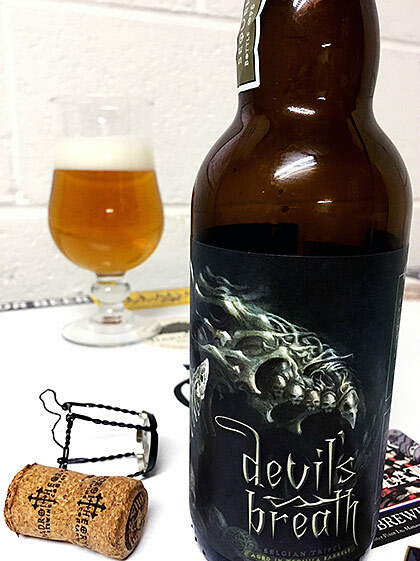 It’s got a lightly viscous mouthfeel and softly warming finish that seems to last forever. A moderate sweetness and twinge of wood linger late in the background. I like everything about this beer except for that banana-y trait that doesn’t seem to want to go away. The tequila within the beer is ridiculously smooth and adds another layer to a pretty solid offering from Adroit Theory. I would say that of all the beers from this Virginia company that I have enjoyed, this may very well be my favorite. Share "Adroit Theory Devil’s Breath"